Verification of Competancy (VOC), snake handlers, catchers and handling course graduates. Verification of competancy (VOC), Snake handlers and Snake Catchers. The Snakeman Raymond Hoser, is the only government certified expert who does verification of competancy (VOC) for snake handlers and catchers who have been trained anywhere and by any means. This allows us to correct any improper and high-risk methods used to handle snakes and correct the endemic misinformation that comes with a number of other training courses. 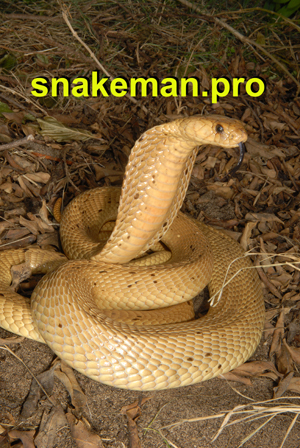 With the proliferation of venomous snake training courses being provided by persons and providers with little if any meaningful experience with venomous snakes and graduates of these courses often being unable to correctly or safely handle venomous snakes, or catch fast moving wild snakes, there has been a corresponding rise in snakebites and deaths from snakebite in Australia. In fact the problem has become so bad, that there are as of 2014 more deaths from Snakebite in Australia than there were before the advent of anti-venoms in the late 1960's. Most snakebite death victims in Australia post 2006 have been graduates of ill-conceived venomous snake handler training courses, the number of individuals now exceeding 20 (by mid 2016), all being bitten when catching and handling venomous snakes after graduating. This indicates a serious and culpable problem of improper training and poor snake handling methods. The Snakeman Raymond Hoser regularly has to retrain groups who have done snake handler courses provided by inexperienced providers after one or more of the graduates has suffered a fatal or near fatal snakebite. To pre-empt the need to re-train people after they have been bitten and nearly killed by venomous snakes or had an associate killed by snakebite, the Snake Man now offers Australia's first Verification of Competancy (VOC) testing and certificates. Because snake handlers may learn their skills from many places, including before and after a snake catching course, including "on the job" when catching and handling snakes, not all graduates of substandard courses may fail a VOC test. However a VOC test will both confirm whether or not this is the case and allow for any retraining to be done as needed to ensure that the snake handler has the skills and expertise to be able to handle venomous snakes safely for both themself and the snake. This is done before the handler gets an otherwise avoidable fatal or near fatal bite. 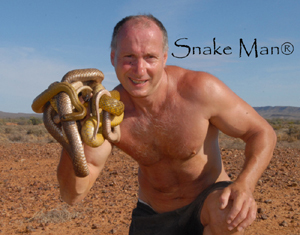 To book a VOC for an individual or a group, it is best to phone the Snakeman on 1 300 1 SNAKE. Set your date ... one on one courses. Snake handler courses for groups (Victoria), and businesses, interstate (non Victorian) bookings, including South Australia SA, Northern Territory NT, Western Australia WA, Queensland Qld, New South Wales NSW, outside Australia, including Asia, Africa, North America and South America, etc (Course details, booking info, etc). Zoologists, mine workers and others who deal with venomous reptiles prefer to be taught by a globally recognized expert for their snake handlers course training. 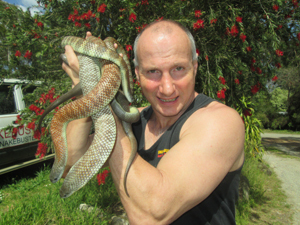 We travel to all parts of Australia and overseas teaching snake catchers, snake capture, reptile relocations, wildlife control, research methods, reptile awareness sessions, workplace safety, snake spotter courses, toolbox talks, site inspections and more. 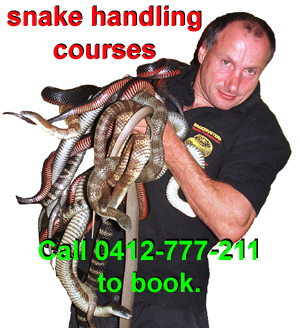 Areas we service for snakehandlers courses, include, Melbourne, goldfields, east gippsland, mallee, wimmera, high country, Murray Valley, Sydney, Canberra, ACT, Southern Highlands, South Coast, Northern Tablelands, North coast, Greater west, western slopes, alps, Brisbane, Gold Coast, Sunshine Coast, Townsville, Mount Isa, Rockhampton, Cairns, Cape York, PNG, Irian Jaya, Darwin, NT, Arnhem Land, Central Australia, Alice Springs, Adelaide, SA, Riverland, Perth, WA, Pilbara, Kimberly, western desert, Gascoyne, Cape Range, Hamersley ranges, Hobart, Tasmania, South Africa, Middle-east, South-east Asia, USA, Europe, South America and elsewhere. Phone us on (03) 9812 3322 for further details (Australia).